It was a noisy day among the excited children in the sports fields. I was running after balls and people with my camera, and of all the shots today I loved the butterfly sitting calmly on a flower. The shot was obviously taken during mid day when the sun was very bright. That is obvious from the washed out petals of the flower. Try and avoid shooting under such harsh lighting conditions. If it cannot be avoided, I would have done the only thing I can think of - use an umbrella over the butterfly to mask the sun. One other thing you should know is that you should avoid photographing a subject when it is perched on something that is in total contrast to it. 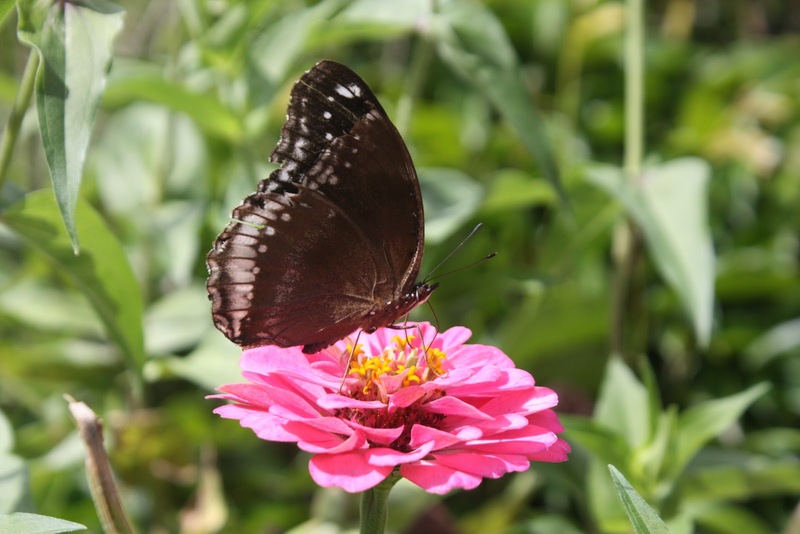 For instance, your butterfly is deep brown – almost black - and the flower on which it is perched is pink – these two colors are in extreme contrast to each other. You could wait for the butterfly to move and settle on something that is more neutral. It is very difficult to manage settings when you are dealing with high contrast subjects. The last bit is that you have centered the subject bang in the middle of the frame. That is not very pleasing. You should have positioned the subject a little to the left. That will be lot more pleasing. 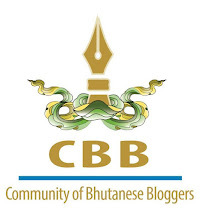 I am giving you this tip to compensate for the missed trip on the 25th .. :) If you are coming to Thimphu today – you will see me at the Clock Tower (Bird Watching Booth) where the WTD is being celebrated. Umbrella over butterfly sounds crazy though (butterflies are hyper, they rest only for a sec or less on one flower) but I am sure going to try shooting in mild light. Thank you for letting me know about color contrast, I will be mindful about it. Positioning on the left is what I will try right away with my next shot. The problem is with the lens. You have to understand that non-macro lenses cannot focus very close - they have what is called the longer minimum focusing distance. Only macro lenses are designed to focus close - as close as 3" in some cases. This can go even shorter with some specialized lens and by adding attachments. Unless the camera's electronic circuitry is malfunctioning, it has nothing to do with focusing because the lens is the eye of the camera. About the butterfly being flighty, that is the daily pain of wildlife shooters - they never pose for you. You have to be quick, you have be good at anticipating and you have to be patient and follow the flighty buggers until you have it where you want it. And, that provably will take you days and weeks and months! Your mention of Macro gave a relieve because there is a button on the lens to shift from Normal to Macro. I am happy to know that the problem is not with me but the lens. I still remember your comment from last year, where you mentioned how you would wake up before the day breaks, drive up to the peak and wait for the right moment to get the right shot. And now when it comes to butterfly, it is no exception, I have to build myself! Thank you for the advice. I promise you I will come up with a butterfly that deserves your WOW! As they say in photography; "dead center is deadly." So never place your subject smack right in the middle of the frame. Which lens have you got? Like Aue Yeshey mentioned, nothing beats a dedicated macro lens, that's if you have one in your arsenal. I don't [:)]- would love to own one someday. But ordinary zooms will do just fine - with a little bit of adjustments here and there. I guess the other trait would be "patience." Be patient, wait for those flighty creatures and shoot multiple images from as many POVs as possible. Shooting in the evening or morning would greatly enhance your image (plus you can catch them quite easily). Lakey, thanks for visiting my blog. Ya, I understood one vital lesson in Photography- patience and speed, two very contrasting element working together. by the way, is Macro another lens? the lens which my friend owns has got option on it to switch from normal mode to Macro, will it not work? aha I could try tey mo...wait! I am a Canon chap and am not aware of their lenses offering those two different switches, so it must be (just a wild guess) a Sigma, Tamron or a Tokina or something else. Well, it will work. I suppose, it does that by switching the minimum focusing range. Yes, Macro lenses are a different class - optically specialized for close-up macro photography. They help you focus very close with enhanced magnification, sharp images, minimum distortions, wider details, etc. But macro lenses are also ideal for portrait photography. I have never got to attach a macro lens on my camera till date. Macro photography, I am told, is a truly amazing field and I intend to try that out soon. how I envy you when you say you are Canon boy because I am just a dreamer. I am yet to own one, and I am sure that would be Canon... anyway, if I am ever buying one I would ask Yeshey Dorji. I think I too love Marco Photography... thank you for enlightening me on that lens. Look forward to your work! Oh, I do post some of my pictures on the blog. Check out "Pic(k) of the day." I'm trying hard to learn and improve:) Besides, I am running a bit low on the posts compared to my brother, so its my contribution to the blog! LoL! Cheerio! Yeah Lakey, you only contributed 14 posts compared to Dawa who did 42, and I am surprised he is your brother...I wish to have a brother with same interest too. I am happy to see that you have bought your own domain: http://www.cholachorus.com/, which is a sign of strong dedication towards blogging. I am going straight for your "Pic(k) of the Day!"